General Hammond gives Carter a note before SG-1's new mission, but a solar flare propels the team back in time to 1969, into a top-secret military facility. There they encounter a young Lieutenant Hammond, who recognizes his writing in the note, and helps them to escape. 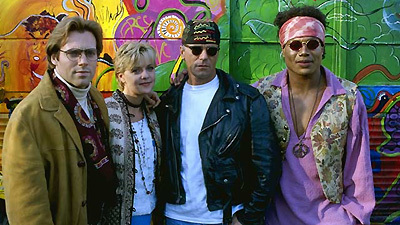 Hitchhiking across country, SG-1 seeks out Catherine Langford, hoping to find the stargate. Carter realizes that Hammond's note contains the key - the time of the next solar flare that will return them to their own time. But a slight miscalculation gives the team a glimpse of the future before returning them home. P2X-555 was the intended destination for the mission. At this time of year, the direct line between P2X-555 and Earth takes the wormhole within 70,000 miles of the sun, making it necessary to update the computer's drift calculation to include gravitational space/time warping. When they didn't arrive, SG-5 completed the mission in their place. After the Abydos mission, Carter researched alternative applications for the gate, including time travel. A massive solar flare occurring at the same moment as gate travel would redirect the wormhole closer to the sun because of the flare's magnetic field, and the increased gravity would cause a slingshot effect back to Earth, travelling back in time. Solar flares on the opposite side of the sun would use the sun's rotational differential to be sent forward in time instead of back. Hammond recognized the cut on Carter's hand, and used Carter's research to look up two solar flares in August of 1969 to include in his note. The Grandfather Paradox states that if you go back in time and kill your own grandfather, your father would have never been born, thus, changing one's own past can change the world in unimaginable ways. The team travelled cross country on Route 66, leaving Colorado on August 4th and arriving at New Jersey on August 10th and Washington DC on August 11th. SG-1 entered the stargate a few seconds too soon and was thrown far into the future where they were met by Cassandra, who sent them home. When Cassandra was old enough to understand, Carter had told her that she would be the one to meet them. In the future, the gateroom was deserted, and Cassandra used a wrist device to activate the stargate without a kawoosh. Daniel speaks 23 different languages. Astronomy, on a small scale, is one of O'Neill's hobbies. Three shots by a zat gun will disintegrate inanimate objects as well. If they remain on Earth, Teal'c will eventually be taken over by his mature symbiote. Daniel visited Catherine Langford posing as the son of Heinrich Gruber, an old friend and partner of Catherine's father who had been involved in the dig at Giza. The gate was powered by two truck engines, and dialed manually. Cheyenne Mountain was a missile silo, 28 floors underground. Hammond was assigned to Cheyenne Mountain as a Lieutenant. Hammond watched the first moon landing from his father's bedside in his hospital room two days after his first heart attack. The stargate, after being discovered by Professor Langford in 1928, and experimented upon before Ernest Littlefield's disappearance in 1945, was now locked away in an armory in Washington D.C. where the military did not acknowledge its existence. Catherine Langford lived in New York, and began her gate research in the late 60's. Michael and Jenny were going to Woodstock before Michael had to leave for the draft. Daniel was 4½ years old (born in 1965). My name's not Kirk. It's Skywalker. Luke Skywalker. A long, long time ago, in a galaxy far, far away.